My take: If you’re a fan of the Harmony series I have no doubt you’ll love Betting the Rainbow. If you haven’t read any of the Harmony series you’ll want to start with the first book (Welcome to Harmony) and enjoy getting to know the fine people of this small Texas town. It’s one of my favorite series! So, now that I’ve gushed a bit about Jodi Thomas’s books let me tell you about the newest. A few lingering plots from previous books come to the forefront in Betting the Rainbow. Ronny is just back from a world tour that began after losing her first love. She’s taking some time to herself at a secluded lake rental just outside of Harmony. Turns out there’s a neighbor and he quietly works his way into her life and heart – at the same time she does the same to him. I enjoyed watching an unexpected love develop between Ronny and Austin. More than a lingering plot, Reagan and Noah find themselves splitting up until a surprise is found in one of Rea’s apple crates. Rea comes up with an ultimatum for Noah but doesn’t put it into words. He has to decide where he’ll allow life to take him all on his own. These two have been dancing around each other since the first book. We’ve seen them grow and mature and fall in love. And then there are some new characters: Abby and her sister Dusti. They had to give up their dreams to take care of their sick mother and the farm. Now they exist trying to keep the farm afloat while thinking about where they wish they were. With the chance to win some money that would enable their dreams to start to come true Dusti enlists their childhood friend Kieran to teach her how to win at poker. He’ll do it but wonders what he stands to lose by getting close to the girl of his dreams. I love the down-home warmth of Thomas’s stories and characters. The narrative always makes me feel like she’s telling me the story. My eyes are closed and I’m listening to a warm, comforting voice telling me about the town of Harmony and the people who live there. And when I turn the last page I smile. Every book, every time. Whenever I start a book I always begin with the research. One by one the characters come to me, sit down and begin telling me their story. As I start to write I always find I have to do research. You’d think after 40 books that I’d know all about Texas, but that will never be true I’m afraid. The research took me in a direction I never expected in BETTING THE RAINBOW. As with all my books I like to tell more than one story at a time but those stories weave around one another making readers feel like they are moving through a town with people getting mixed up in the problems of others at the same time they try to solve their own mysteries. The story in BETTING THE RAINBOW is set amid a few weeks of summer when the whole town becomes involved in a fund raiser to benefit the town library. Instead of the usual things groups do to raise money, the friends of the library decide to hold a poker night with a grand prize being a buy-in to a huge game in Las Vegas. Dusti Delaney sees the game as her one chance to change her and her sister’s lives. Betting the rainbow is a term used in poker when a player decides to bet it all on one pot and that is what Dusti is willing to do. Only problem for me as the writer…I didn’t know how to play poker. Research. I talked a friend into taking me to a weekly game out in the country. Thirty bucks later, I had the basics of how to play. Next I read every book I could find on Texas Hold’em and how women survive in the game. I talked to poker players and asked endless questions. Then, one called me to join her at the Cracker Barrel for breakfast. In the middle of our pancakes she said, “I’m going to Vegas to play next week. Come along with me.” I booked my plane, talked a friend into going with me, and packed before lunch. I wasn’t there to watch the game. I was there to watch the people. So, come along with me on a great adventure with the people of Harmony as they hunt wild hogs, learn to play poker and fall in love on a lake off Rainbow Lane. I’m betting you’ll walk away happy when you finish BETTING THE RAINBOW. Thomas is a master at creating damaged yet appealing characters, and their expressions of love — as siblings, as friends, as partners — are intense and beautiful. 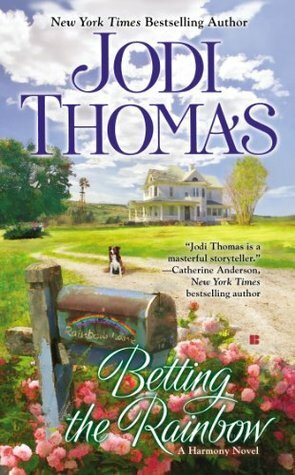 Their paths to happiness are interwoven in an intricate tapestry with the tournament as backdrop, combining in an epic tale of the kind of love that lasts forever – Publishers Weekly (starred review) on BETTING THE RAINBOW. Jodi Thomas is the NY Times and USA Today bestselling author of 39 novels and 12 short story collections. 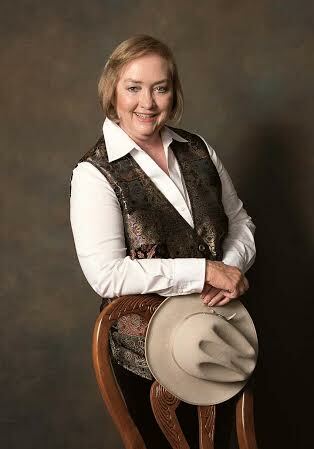 A four-time RITA winner, Jodi currently serves as the Writer in Residence at West Texas A&M University in Canyon, Texas. Thanks for visiting, Jodi. I like the unique library fundraiser and the research you did for the story 🙂 I hope readers will come back later today to read my review of BETTING THE RAINBOW. Hint: I loved it!